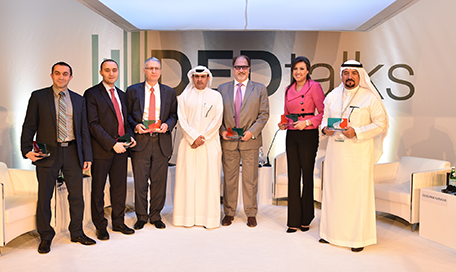 Raed Safadi, Chief Economic Advisor, DED, participating in a panel discussion at DED Talks, a knowledge exchange platform being organised by the Department of Economic Development (DED) said: “We have seen development here since late 60s. But the diversification started back then. It’s a past, present and future phenomenon. Back in the early eighties 55 per cent of Dubai’s economy was oil based. Today it is less than 2 per cent. It emphasises the role of the government in helping the sectors to diversify,” he said. He further added that a new company law, commercial law, a new public-private partnership (PPP) law and a bankruptcy law is going to add incentives to the private sector. Inaugurating the event Sami Al Qamzi, Director General of DED said Dubai has today achieved a position where only 2 per cent of its economy today depends on oil and how the Emirate has been marching ahead following guidelines set and developing as knowledge based economy. Giving details of various sectors that have successfully emerged following continuous investments in the field of infrastructure and technology he said, “His Highness has articulated his decision and strategy on the post oil economy. This strategy has succeeded in diversification of the economy. We have witnessed increased productivity, the growth of the retail and wholesale sector, the tourism sector, transportation and technology. We are also going to be the leaders of Islamic economy. The total value of Islamic Sukuk is Dh121 billion. IMF has described UAE as the most diverse and competitive market in the region,” he said. Dubai is a perfect example for all GCC economies to follow as they travel the path of diversification, a senior official of the International Monetary Fund (IMF) said. Osama Kanaan, Director, IMF Centre for Economics and Finance, who was speaking during the first DED Talks, a knowledge exchange platform being organised by the Department of Economic Development (DED) in Dubai, to discuss economic trends, indicators and updates bringing together experts, investors, entrepreneurs and businessmen from various sectors. The discussion point during the first event was Post Oil Economy, and the Gulf Countries journey towards diversification. Raed Safadi added: “the ultimate aim is to more productivity. The 2021 vision of the UAE government he said has laid the groundwork for the future course but the journey towards achieving the goals is a continuous job. “Just take the example of the education policies that we have set up. The tertiary education is to shift to a STEM like system. In doing so you change the composition of a private public sector. The results will be coming online and would continue to bear fruit,” he said. Hatem Samman, Chief Economist, Saudi Arabian General Investment Authority who was one of the participant in the panel discussion said Saudi Arabia has rich endowments, be it tourism or mining. It has not been tapped….. We did not concentrate on economics and instead concentrated on political aspects. But that is changing. The vision 2030 of the government has clearly spelled out the journey forward,” he said. Stating that the road ahead is challenging he emphasised, “it is imperative that we face these challenges. About 80 per cent of households in the Kingdom get their revenue from government spending. The 2030 vision has been clearly spelled out,” he added. Kanaan also emphasised that one of the key factors is institutional development. “In different countries it has progressed at different levels,” but added that there is a lot still that needs to be done in terms of institutional development in public sector.